Cases for regular Marching Drum Snares. Cases for High Tension Snares, Tenors and Bass drums up to 28". Complete with strong carry handles and strong straps with quick lock clips. Bass cases come with plastic covered carrying handles in lid and body. 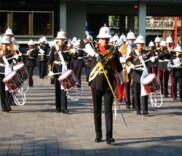 Specially designed to securely fit the Premier 97S Military Side Drum. Complete with strong carry handles and strong straps with quick lock clips. Marching Side drum case Specially designed to fit the Andante Reactor. Complete with strong carry handles and strong straps with quick lock clips. 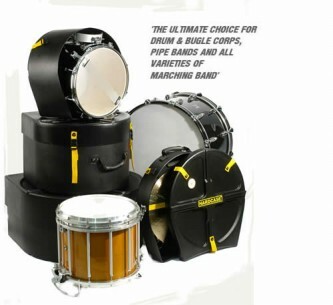 Specially designed to securely fit the Premier HTS700 and HTS784 Side Drums. Complete with strong carry handles and strong straps with quick lock clips. Specially designed to securely fit the Premier HTS400 Side Drums. Complete with strong carry handles and strong straps with quick lock clips. Tenor drum case suitable for all regular 15"x12" steel hoop Marching tenor drums.Complete with strong carry handles and strong straps with quick lock clips. Tenor drum case suitable for all regular 16"x12" steel hoop Marching tenor drums.Complete with strong carry handles and strong straps with quick lock clips. Tenor drum case suitable for all regular 18"x12" steel hoop Marching tenor drums.Complete with strong carry handles and strong straps with quick lock clips. Tenor drum case suitable for all regular 16"x12" wood hoop Marching tenor drums.Complete with strong carry handles and strong straps with quick lock clips. Bass drum case suitable for all regular 18" Marching Bass drums. Complete with strong carry handles and strong straps with quick lock clips. Bass drum case suitable for all regular 20" Marching Bass drums. Complete with strong carry handles and strong straps with quick lock clips. Bass drum case suitable for all regular 22" Marching Bass drums. Complete with strong carry handles and strong straps with quick lock clips. Bass drum case suitable for all regular 24" Marching Bass drums. Complete with strong carry handles and strong straps with quick lock clips. Bass drum case suitable for all regular 26" Marching Bass drums. Complete with strong carry handles and strong straps with quick lock clips. Bass drum case suitable for all regular 28" Marching Bass drums. Complete with strong carry handles and strong straps with quick lock clips. Bass drum case suitable for all 28"x12" Traditional Bass drums. Complete with strong carry handles and strong straps with quick lock clips. Specially designed to securely fit the Premier HTS700 and HTS784 Side Drums. Complete with strong carry handles, wheels and strong straps with quick lock clips. Tenor Set case suitable for all tenor sets up to 6 drums. Complete with strong carry handles and strong straps with quick lock clips. Fitted with 4" wheels.